Astronomical observatories on Earth, even those on the highest mountain peaks, are plagued by clouds and poor visibility and by the fact that most radiation from celestial objects never penetrates the atmosphere. Thus, much information about the universe cannot be obtained from the ground, and what is available is seriously degraded by atmospheric conditions. Above the atmosphere, however, the view improves dramatically; if it were practical, most telescopes would be used in space. X-rays reveal high-energy events such as the explosive death of stars. Cosmic ray detectors record the arrival and travel paths of these high-speed nuclei from beyond our solar system. Spacelab and the Shuttle have enabled scientists to place larger and more powerful instruments above the atmosphere, to operate them directly as if they were in an observatory on the ground, and to return film and instruments for postflight analysis. Future Shuttle flights also will provide opportunities for co-observation, viewing the same object or area with different instruments simultaneously; for example, stars may be observed by ultraviolet and X-ray telescopes at the same time for a correlated record of their behavior. For the Spacelab 2 mission, three large astronomical instruments - an X-ray telescope, an infrared telescope, and a cosmic ray detector (front to back) - were carried in the Shuttle payload bay. By analyzing the tracks of ions in a detector, scientists can determine the charge and identity of cosmic rays. During the Spacelab 2 mission, an X-ray telescope obtained the highest energy X-ray maps of celestial objects made to date. ....ground, and new data that cannot be collected by less sensitive instruments. Instruments in space can map the sky with great accuracy, take wide-angle photographs or zero in on single objects, record very faint radiation from sources within our galaxy or tar beyond, capture cosmic ray particles traveling at nearly the speed of light, measure how much radiation is emitted from a source at a given wavelength and how it changes, and peer into events and processes that are invisible from the ground. While the Shuttle is being used with success as an observatory platform, in some respects investigators are still learning how to do this sophisticated research in space. Each flight helps them better understand how to design and operate instruments that are sensitive to faint emissions of radiation from deep space but are protected from similar emissions arising from the Earth and the Shuttle itself, that can hold highly accurate and stable pointing despite the Shuttle's motion, and that can be shielded from contamination and temperature extremes. They also are learning how scientists on the ground and on the Shuttle can best interact with and control these complex instruments. In response to the technical challenges of high-precision astronomy and astrophysics in the Shuttle environment, new devices and new techniques are bringing the complex universe into ever-sharper focus. Cosmic Rays: Several cosmic ray particle detectors have flown aboard the Shuttle, the most sophisticated being the huge (2 ton) Cosmic Ray Nuclei Experiment on Spacelab 2. Although cosmic ray particles bombard Earth's upper atmosphere continuously, the flux in any one place is very low, particularly for the highest energy particles. Thus, it takes a large collector  and a long time to "catch" enough cosmic ray particles to draw conclusions about their energy and mass. Identification of the particles and measurement of their energies pose major technical challenges. The Spacelab 2 detector was designed to study cosmic rays with energies almost 100 times greater than those previously studied. 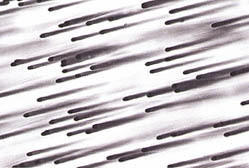 During the mission, it recorded some 40 million events at a rate of 70 per second. Only one-tenth of 1 percent of the data, however, represents the rare ultra high-energy cosmic rays. The large but delicate apparatus operated very well; analysis of the particle tracks through the detector is providing a mass of data about cosmic ray trajectories, charge states, and energies. This information is revealing the composition and origin of high energy particles from other parts of the universe. Much smaller detectors flown on other missions have had comparable success in recording lower energy particles. The highly sensitive Spacelab 3 Ions instrument detected about 20,000 cosmic ray events; the particle tracks will be painstakingly analyzed to extract information about trajectories, arrival times, and charge states. 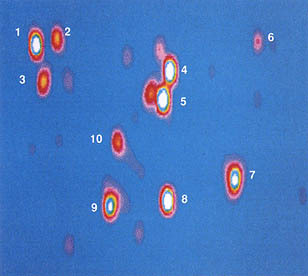 A detector on STS-3 recorded several high speed impacts of cosmic dust particles in an investigation of the particle population in the spacecraft environment. The value of the Shuttle/Spacelab system for these investigations is that large detectors can be flown and returned for analysis after a sufficiently long collecting period. From tell-tale tracks in the detector materials, scientists are gaining new insight into the enigmatic particles that race through space at almost the speed of light, bringing information about the violent events that produced them and the interstellar fields through which they have traveled. X-Ray Views: The most successful astronomical observations from the Shuttle to date have been made with X-ray telescopes. These novel instruments carried on the Spacelab 1 and 2 missions performed essentially flawlessly and during many hours of operation collected many high-quality images as well as spectral data. For the most part, the instruments were used for detailed examination of known X-ray sources of various types - supernova remnants, galaxy clusters, quasars - rather than for search and discovery surveys. Scientists are pleased with the new information. One of the most rewarding aspects of these missions was the direct operation of the telescopes by scientists on the ground at the Payload Operations Control Center. The scientists issued instrument commands, received data, and engaged in preliminary data analysis throughout the missions. This immediacy of instrument control and data collection is a new experience offered by the Shuttle/Spacelab system and is well suited to astronomical observations. 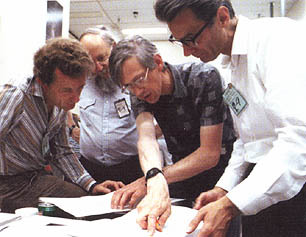 Scientists on the ground planned observations and controlled the operation of the X-ray telescope. 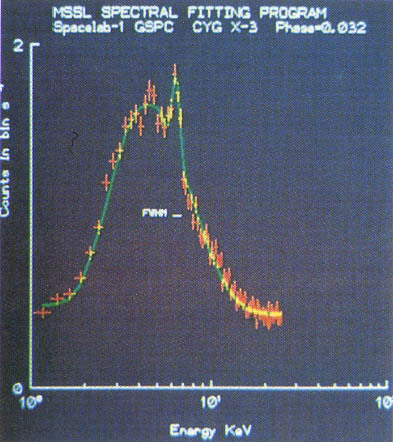 ...X-ray source near the center of our galaxy; discovery of a hard, extended component in the emission around the galactic center; and mapping of the Perseus cluster of galaxies four times further out radially than was previously possible, along with observations of changes in its spectrum at different positions, also observed by a Spacelab 1 instrument. 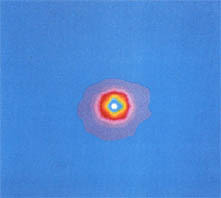 The dual X-ray telescope flown on Spacelab 2 used a new technique to yield the first true two dimensional images in high-energy X-rays. X-ray astronomy is still a relatively young discipline, but the advances in instrument sensitivity and sophistication demonstrated on Shuttle flights are accelerating its progress. 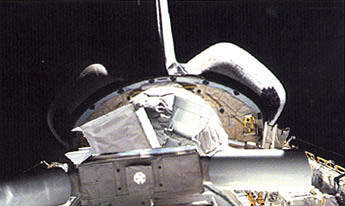 Ultraviolet Views: The Shuttle also appears to be a suitable platform for ultraviolet telescopes, such as the Far Ultraviolet Space Telescope (FAUST, Spacelab 1 ) and the Very Wide Field Camera (VWFC, Spacelabs 1 and 3). However, due to technical difficulties with these ultraviolet instruments, the results to date are less revealing than anticipated. This map, made in X-rays, shows all the sources observed at length, by the Spacelab 2 X-ray telescope. The combined X-ray emissions from a cluster of galaxies in Perseus span the 2.5 to 25 KeV energy band. This image extends the map of the cluster four times farther than previous measurements and shows areas with higher energy X-ray flux. X-ray energy concentrations are highest at the center of the galactic cluster (white) and lowest near the fringe (pink). Clusters of galaxies were prime targets for the X-ray telescope which studied not only the individual galaxies but also the interstellar matter and gases throughout the cluster. 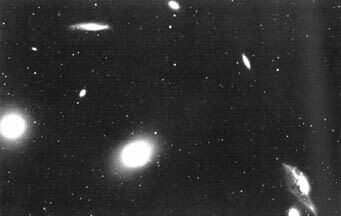 This visible light image shows a cluster of galaxies in Virgo. ....it overexposed. Only a few usable images were obtained, among them the first far ultraviolet image of the complete Cygnus Loop supernova remnant. The intense background that contaminated the film was determined to be non-astronomical, most likely caused by glowing arcs of atomic oxygen that encircle Earth at tropical latitudes. To avoid this problem on future reflights, investigators have already modified the instrument to record photons electronically as they arrive rather than record them on film as time exposures. This electronic detector will be able to analyze the cause of the film fogging that compromised Spacelab 1 observations. Understanding the causes of background interference - whether they are natural or induced by the Shuttle - is important because future space telescopes will be viewing under similar conditions. These four maps of the galactic center in specific energy ranges show how sources may radiate at one energy level and not at all at others. For example, GX3+1 (upper left corner of photos) radiates strongly in the energy ranges from 3 to 12.5 keV (a), much less between the energies of 12.5 to 20keV (b&c), and disappears, emitting no radiation at higher energies of 20 to 32 keV (d). An X-ray spectrometer flown on the Spacelab 1 mission collected high-resolution spectra that provided information on the temperature, elemental abundance, and electron density in the hot plasma generally associated with cosmic X-ray sources. This spectrum of Cygnus X-3, a galactic X-ray sources, reveals intensity variations with a period of 4.8 hours, implying binary motion of stars in a very compact system. The Far Ultraviolet Space Telescope (FAUST) took this 2-minute exposure of the Cygnus Loop, a supernova remnant located about 1,500 light-years from Earth. The image yielded information on the small-scale structure of the interstellar medium around the supernova. A cloud of hot stars that forms a bridge between two galaxies was imaged by the Very Wide Field Camera. The Large Magellanic Cloud is centered in the circular image with the other galaxy (the Small Magellanic Cloud) to the left and the Milky Way on the right. The faint region within the circle in the enlargement (below) is part of the cloud of stars between the galaxies. ....edge of sensitivity for current far ultraviolet observations. The new detector is possible because of advances in technology since FAUST was first designed; with reflight opportunities, instruments can be upgraded as new technology becomes available. 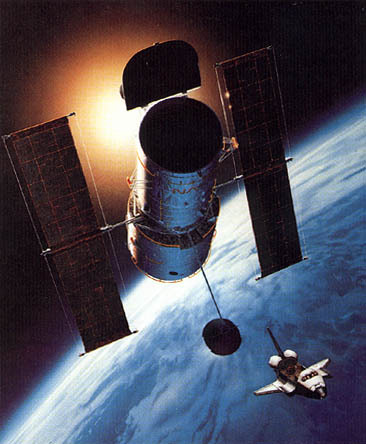 The ability to bring an instrument back after a mission and improve its performance for the next mission is a unique advantage of the Shuttle and Spacelab. The Very Wide Field Camera has flown twice. 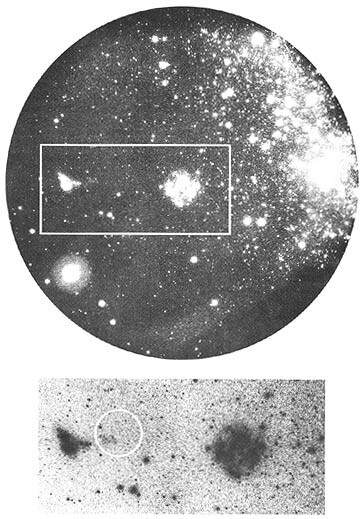 On the Spacelab 1 mission, the camera operated properly and completed 48 exposures of 10 astronomical targets, including a superb ultraviolet image of a bridge of hot gas between the Large and Small Magellanic Clouds. These images can be used to search for new ultraviolet objects and to understand known objects better. However, the planned viewing times for the instrument were shortened as a result of the delayed launch date and shorter orbital nights, and most of the photographs suffered from a high background level of stray light from Earth's twilight/dawn horizon. About 40 percent of the planned exposures were achieved. On the Spacelab 3 mission, complications arose and no images were made. Infrared Views: The goals of infrared astronomy on the Shuttle are both scientific and technical&emdash;to map and measure celestial sources of infrared radiation and to evaluate infrared telescope technology in the Shuttle environment. The Infrared Astronomy Satellite (IRAS, 1983-1984) led the way for infrared telescopes, successfully mapping most of the galaxy by means of a supercold (cryogenic) detector system. Now investigators are doing the necessary follow-on studies to expand our knowledge of the infrared universe and to improve the performance of cryogenically cooled instruments. A small infrared telescope (IRT) carried on the Spacelab 2 mission produced mixed results, meeting more technical objectives than scientific. An infrared telescope must be cooled to keep its own thermal radiation from masking the radiation from celestial sources. Performance of the superfluid helium/porous plug cooling system exceeded expectations, demonstrating convincingly that an extremely low operating temperature ( 3.1 degrees Kelvin) can be established and maintained. The cryogenic system proved to be both stable and efficient, meeting all the technical requirements for scientific performance. The astronomical results of this initial foray, however, were partially compromised by an unexpected problem. Shortly after the telescope cover was removed, the mid-wavelength detectors became saturated by an intense infrared background, making planned observations of taint celestial sources impossible in that part of the spectrum. Despite this difficulty, the telescope successfully mapped about half of the galactic plane at shorter wavelengths than IRAS, filled a 5-degree gap in IRAS data, and covered another region not in a standard sky survey. Scientists also investigated the origin and nature of the surprising infrared background. 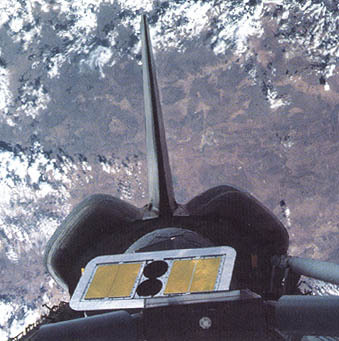 The investigation yielded useful information about the infrared environment of the Shuttle; however, the prime candidate explanation, based on a realtime video survey and postflight examination of the telescope, is that damage to the light shield caused some of the high background level. 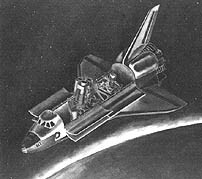 More was learned about the Shuttle environment by the IRT in a series of co observations with other instruments to deter mine whether the Shuttle glow phenomenon or experimental electron beam firings would interfere with infrared astronomical viewing. 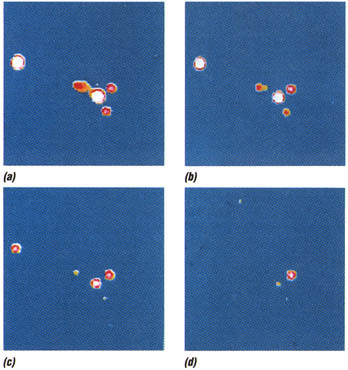 These experiments indicated no apparent infrared effect of the visible Shuttle glow. Observatories in Space: The nation's strategy for astronomy and astrophysics over the next few decades is a multispectral exploration of the universe. This campaign to observe the universe as it appears in each region of the electromagnetic spectrum requires diverse instruments and spacecraft, ranging from small rocket-borne detectors to large observatory platforms orbiting near the Space Station. The Shuttle and Spacelab will play a significant role in bringing this strategy to fruition. 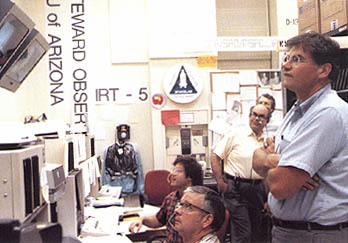 Spacelab 2 investigators keep watch during Infrared Telescope operations. ...launched and serviced in the Space Shuttle and to have an orbital life of many years. The Shuttle is also important as an assembly and deployment site for ambitious future systems of antennas, such as the Large Deployable Reflector, an infrared observatory. Scientists welcome these new opportunities for prolonged observations from space. Besides serving as the launch vehicle and service center for the large observatories, the Shuttle will serve as host carrier for smaller instruments in complementary observations. Two series of Spacelab missions dedicated to astronomy and astrophysics are planned: the Astro missions for ultraviolet and X-ray observations and the Shuttle High Energy Astrophysics Laboratory (SHEAL) missions for X-ray observations. Each mission carries compatible instruments that can operate independently or in concert for detailed studies of the same celestial objects that will be scrutinized by the large observatories. These Shuttle-borne instruments make important observations that help to define and corroborate the viewing programs of the large observatories. They also have the virtue of being returned, modified, and reflown in response to discoveries and changing research goals. 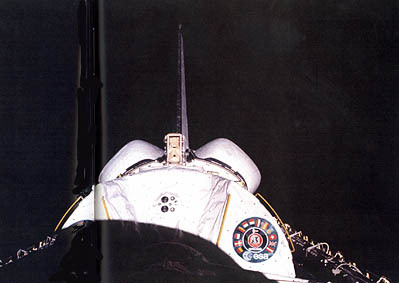 Within the disciplines of astronomy and astrophysics, the use of the Shuttle/Spacelab as a manned observatory platform is a prelude to the Space Station era, when attached or coorbiting platforms become available for observations of longer duration. Even then, Shuttle flights will remain important for proof-testing of new instrument concepts as technology advances. The Shuttle and Spacelab are necessary elements in the broad strategy to chart the universe on all scales, at all wavelengths. In this infrared map of the galactic center, the colors represent different intensities of surface brightness. The map made at short wavelengths (2 microns) will augment Infrared Astronomical Satellite (IRAS) data. This infrared image, also made at 2 microns, shows how surface brightness varies at the center of the galaxy. Below [above] : Instruments carried on the Shuttle make observations that complement observations by the Hubble Space Telescope and other large astronomical observatories. G. Fritz, Naval Research Laboratory, Washington, D.C. The Astro telescopes will survey the sky, studying the signatures of stars, galaxies, quasars, planets, and comets.